Steven Outram responds with feeling to the changing natural effects of climate and skies over simple Gloucestershire land forms His contemporary paintings survey the infinite potential of seeing the extraordinary in the British landscape. In ''Moon Rising Mist Descending'' we are shown a world shrouded in mist and lit by pale moonlight. 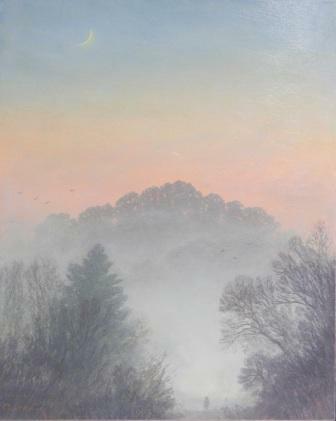 The colours used and forms emerging from the mist add to the sense of atmosphere created. This is a very balanced composition, the delicately rendered tracery of winter trees parting to allow a single figure to walk between. The rounded form of the distant hill and the tiny crescent moon all add to a sense of balance and serenity in the painting.